Even if you were not born with a disability you can acquire one quite easily through illness, accident or old age. With 11% of the world’s population disabled (according to the World Health Organisation) all of us are going to be touched by a disability, so it is important that we learn to not segregate but to celebrate and thus build a world where we all belong. Children with disabilities should be included in mainstream schools in a meaningful way. Other children should not shun their school mates. Adults should teach by example that disability is not to be feared or mocked. That it is not contagious, infectious, bad, a sign of divine punishment nor karmic retribution. If there’s a person with a disability in your family, school, neighborhood or workplace treat them as you would anyone else. A smile is more appropriate than a stare. Most of us make mistakes because we don’t know how to interact comfortably with a person who is disabled, we hope these videos will help. As the mother of a person with a disability, it has been my privilege to spend time with not just my son, but hundreds of people with disabilities and thousands of those who work with them. I have chosen to work with them for the sheer joy of it. Yet I get asked, “Why are you doing this? What can these people do?” Funders, individuals and corporates want to know what the people they help can give back to society. A return on investment? Is the measure of a person just what he can do? The World Health Organization says 11% of the world’s population is disabled. My son Chandima writes, “If you were not born with a disability, you can easily acquire one through accident, illness or old age.” So, one way or another, all of us will be touched by disability. Fortunately, we live in a brave new world where inventions and innovations abound that help many people with disabilities lead productive, stimulating lives. In spite of this, I am still asked what the point is of working with people with disabilities. What can they give back? What can they do? I have been asked this so often that I tried to find ways, ordinary ways, in which people with disabilities contribute to society when the reality is their contribution is extraordinary. People with disabilities, just by being who they are, change every person who love, care and work with them. My son has always attracted truly wonderful people who always said, “You have brought out the best in us.” I have heard this from many people who have spent time with people who are generally seen as being severely disabled. I have just finished reading a book by Arun Sharoul whose son is grievously impacted by Cerebral Palsy but whose spirit shines through, inspiring his parents to establish India’s first schools for children with Cerebral Palsy. I am not saying that my son, or these other children, became disabled so we can be better people. That would be an abominable thought. But the fact remains that they do change us for the better: isn’t that enough? Would we not benefit from a kinder, gentler world? Look around you at the world and ask isn’t kinder, gentler people what we need the most? Now let’s look at what people with disabilities who get the proper supports give back. Here is a beautiful little girl born in the US in 1880 to a wealthy family. She would have grown up, become a wife and a mother and probably led an ordinary life. Except that a common childhood disease contracted when she was one and a half years old left her blind, deaf and mute. Imagine what it must have been like for a toddler to be suddenly adrift in a dark silent world? Fortunately, a teacher, miracle worker Anne Sullivan entered Hellen Keller’s life. Anne taught Hellen to communicate using finger spelling. Hellen Keller went on to get a BA from Radcliffe University. A lifetime spent working for disadvantaged people won her a dozen awards from just about every country – from the Presidential Medal of Freedom in the US to Japan’s “Sacred Treasure”. Hellen Keller was named one of the most influential people of the 20th Century. She led an extraordinary life of service and achievement. 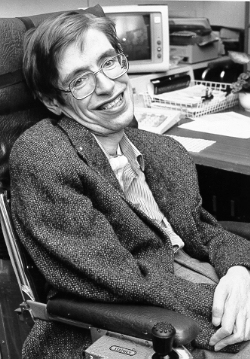 Here is Steven Hawking whose ravaged body houses a mind that rivals Einstein’s. “I thank God that my disability came after I had already proven my intellect.” Imagine what that implies. Let’s talk about Anne McDonald from Australia, left in an institution when she was only four years old. She was so neglected and starved that at age 16 she weighed only 12 kilograms. When she was 14, she too encountered an extraordinary teacher, Rosemary Crossley. Anne and Rosemary developed a system of communication that worked for Anne. She sued the state of Victoria, Australia to get herself out of the institution and went on to get a BA from Deakin University and became a passionate advocate for the rights of people with disabilities. She was given an award from the National Parliament of Australia. The system of communication developed by Anne and Rosie went on to rescue my son and thousands of other nonverbal children and adults around the world from their silent worlds. My son Chandima was only four years old when an eminent neurologist in the US told me that Chandima’s future would be in institutions. I was told that Chandima was profoundly retarded, severely autistic. My son is now a poet, a writer – shortlisted for the Gratiean award – and Co Founder/Co President of E.A.S.E Foundation which transforms lives every day. I ask what can people with disabilities give society? This is the understanding we bring to our work and that is what makes us joyful.